When I was a child, a trip to Dublin was a Very Big Deal Indeed. The memories remain vivid, involving chocolate fudge cake in Bewley’s, books and Crayolas from Easons, new shoes from Switzers, and, on occasion, a fancy coat for my mother from Henry White, where the very air seemed luxurious. My sister and I inevitably conked out on the journey home, footsore from walking in our new shoes (we always insisted on wearing them NOW), but supremely satisfied with our swag. In those simpler days of hand-me-downs and making do, trips to the capital were something to be savoured — although I’m certain they awakened my inner shopaholic. These days, however, I’m just another commuter, and associate Dublin with work, not play. I’d forgotten the fun, and it was time to remedy that. My mission: a weekend of stimulation and jollity in the metropolis. Home for the duration was the five-star Conrad, which is perfectly situated in the heart of the action. I parked in the hotel’s underground car park; with the city sights and delights so near to hand, I was happily opting for shank’s mare until home time. My room — decorated in shades of eau-de-nil and grey, with a vast bed, herringbone floors, and acres of marble — was a delight (the Conrad recently completed a €13m refurbishment), and I made myself at home in a bathful of Shanghai Tang bubbles, with a reviving Nespresso in hand. Heaven. My other half, hard to pin down at the best of times, wasn’t arriving until the following day, leaving me free for a girls’ night out with the Boho Queen, a supremely stylish friend I hadn’t seen for aeons. I’d left it to her to choose a dining spot, and she’d settled on Etto (below), located on Merrion Row, a stone’s throw from my luxurious lodgings. It’s a tiny restaurant with a big reputation, and as BQ and I chatted away, it became clear why. It’s perfection. Every dish was divine, and evidence of its attention to excellence abounded, not least in the peerless provenance of the produce . We’d chosen to dine early, and were only warming up in the catching-up stakes, so BQ, on hearing that I’d never set foot inside the Shelbourne, insisted we adjourn there for post-prandials. 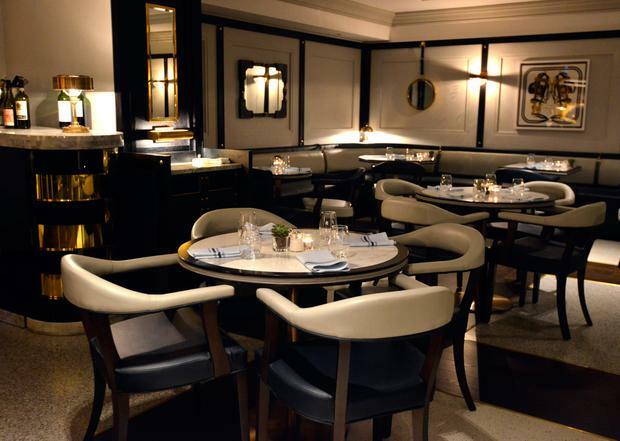 The Grand Old Lady’s wall-to-wall marble and gilt provided the perfect foil to Etto’s serene minimalism. We were lucky to bag a red leather banquette, as the place was abuzz with rugby fans celebrating a masterly win. Needless to say, we were among the last to leave. Dublin can indeed be heaven. Next morning, my slightly sore head was soothed by a bucketload of exceedingly good coffee and some comforting carbs from the Conrad’s bountiful breakfast buffet — porridge and maple syrup; a little bit good, a little bit bad! Himself arrived on cue, buzzed at spotting trad superstars The Gloaming in the lobby; turns out they were playing in the neighbouring NCH. We set off, the sunshine smiling on our leisurely trek across the city to the Teeling Whiskey Distillery, for a tour and tasting. Despite our unhurried pace, we were a little early, so finding ourselves passing hipster heaven, aka The Fumbally, we made a detour to assess its cooler-than-cool coffee for ourselves. Dublin 8 reminds me of the city I used to know (albeit with better coffee) as a student back in the late 1980s — slightly gritty, a bit rough around the edges, but endlessly exciting. The Fumbally also has that vibe, and we loved it, not least because of the excellent brew — 3fe, with a little magical-sounding sunflower milk added. Teeling Whiskey Distillery is a hop, skip and jump away, in the heart of the Liberties (the area, established in the 12th Century, had its own jurisdiction; hence, its own ‘liberties’ separate to the laws of the municipality). Whiskey distilling is a longstanding tradition here, with the ‘Golden Triangle’ of distillers peaking in the 19th Century, while a subsequent trade war with the British Empire and American prohibition decimated the industry. The Teelings have roots here — in 1782, Walter Teeling, an ancestor of Jack and Stephen, the current whiskey-distilling brothers, opened a distillery near St James’s Gate, and ran it for 40 years. The current Teeling Whiskey Distillery was, on opening, the first new one in the capital in over 125 years, and it is thriving. It’s in a handsome building, which has hints as to its function in its construction: window shapes echo maturing barrels, while copper accents pay homage to pot stills. 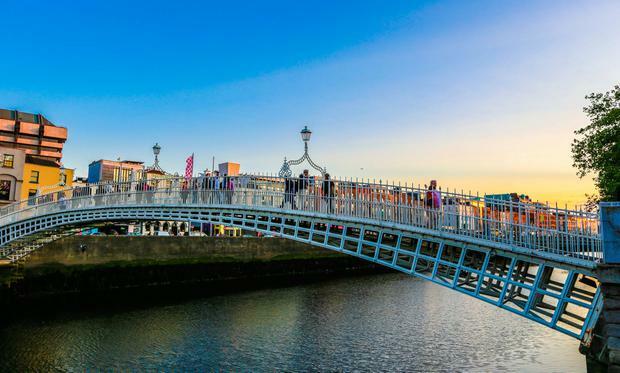 The tour is a jolly romp through the history of the area, whiskey making in Dublin (including the great Dublin whiskey fire of 1875 when, for reasons too complicated to go into, 13 people died from drinking poo-filtered whiskey) and the history and revival of Teeling whiskey brands. It’s thankfully not overly heavy on technical details, but Eve, our affable, knowledgeable guide, had in-depth answers for any who wished further insight into uisce beatha. The best part of the tour for most, I’d imagine, is the whiskey tasting at the end; we opted for a Trinity Tasting, consisting of a Teeling Small Batch Whiskey; a Single Grain; and a Single Malt. Having sniffed and supped and selected our favourites (the Single Malt was the star for me), we then adjourned to the bar for another first for me: an Irish Coffee. How I’ve managed to spend almost half a century on this planet without imbibing such an iconic drink, I’ve no idea, but it was worth the wait, not least because the Teelings add an inspired twist with their own aromatic Spiced Stout Syrup, the recipe for which can be found on teelingwhiskey.com, and which I most definitely will be making for Christmas. It’s a humdinger. 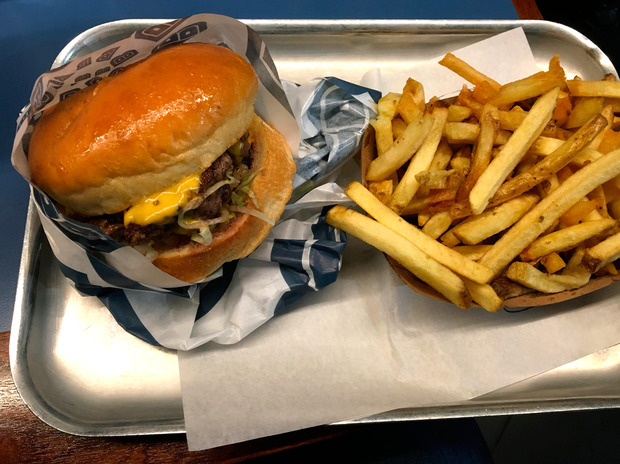 All that booze had made us a little peckish, so we meandered on to the foodie Mecca of Camden Street, plumping for Bunsen (above), where we had a hangover-soothing burger and fries each. It’s a no-frills joint that does fast food really well. Refreshed and revived, we traced a zig-zag route back to the Conrad, detouring when Himself pointed out that Marsh’s Library was nearby and worth a look. The 18th Century public library is straight out of a Dan Brown novel, with its serried rows of oak bookcases, with creaking rolling ladders attached so you can reach the ancient tomes, which include rare incunabula (books printed before 1500). Archbishop Marsh, its founder, is said to haunt the place; an old man’s ghost has been spotted rummaging through the tomes on occasion. Marsh’s niece, Grace, whom he had reared, fell in love and eloped, leaving a note in a book explaining her decision to her favourite uncle — his ghost is still searching for it, apparently (see marshlibrary.ie). Dinner that night was at the Conrad’s very stylish restaurant, The Coburg — the name is from the nearby Iveagh Gardens, once known as the Coburg Gardens (originally designed for the enjoyment of the Earl of Clonmell, aka “Copperfaced Jack”). Again, I’d never been, so we took a stroll through, before sprucing up to dine. The Coburg’s ambiance is elevated by the attention to detail, not least in the decor: big brass snaffles adorn the leather banquettes, no doubt a nod to the Coburgs’ love of horses (the British royals were Saxe-Coburgs until 1917). The food was fab, from Himself’s retro prawn cocktail to my oh-so trendy pink-tinged risotto. We did adjourn to Lemuel’s — named after Gulliver’s Travels’ narrator — for a vin rouge or two, but it was early to bed as I had a date with the shops the next morning. And yes, I went home with some new shoes... and lingering memories of what truly was a capital weekend. 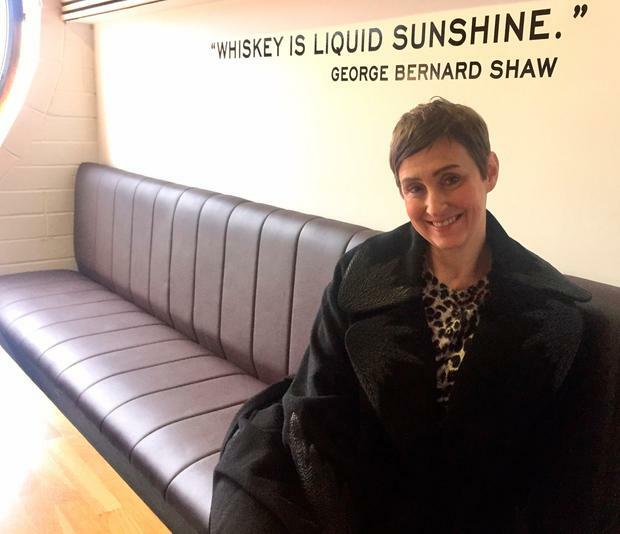 Gemma Fullam stayed as a guest of Conrad Dublin, which has been transformed following a major refurbishment programme heavily inspired and influenced by Dublin’s rich literary culture and local heritage. The renovation programme features a stylish new design for guest bedrooms and suites, a full makeover of the Presidential Suite, the opening of a new, all-day brasserie, together with a new ground-floor lounge and bar. Guests will also notice a smart, welcoming, new lobby area. 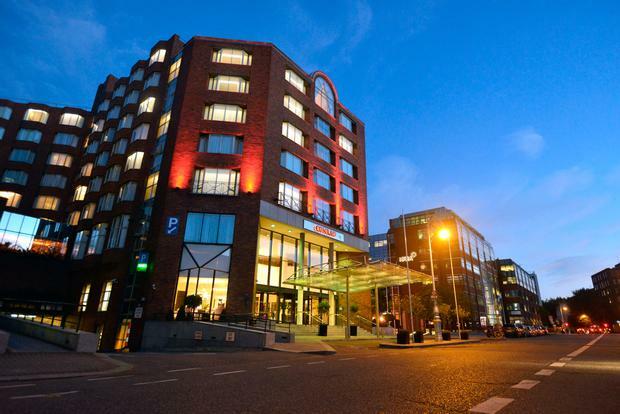 With secure on-site parking, an overnight at Conrad Dublin is an easy experience to navigate, and is an ideal city base for exploring our wonderful city. Weekend summer packages cost €379 per night for two people sharing with breakfast, and secure parking included. Families wishing to stay can avail of an adjoining bedroom less 50pc of best available room rate. Contact 01 6028900 or see conraddublin.com for bookings.